Substantial sums of money have been poured into developing countries by donors, aid agencies and NGOs to improve people’s access to water. However, many of the constructed water sources have broken down or are dysfunctional. At the same time, donors, governments and NGOs rush to achieve coverage targets, ambitiously set and inaccurately measured. This paper proposes a new way of measuring the impact of investments. 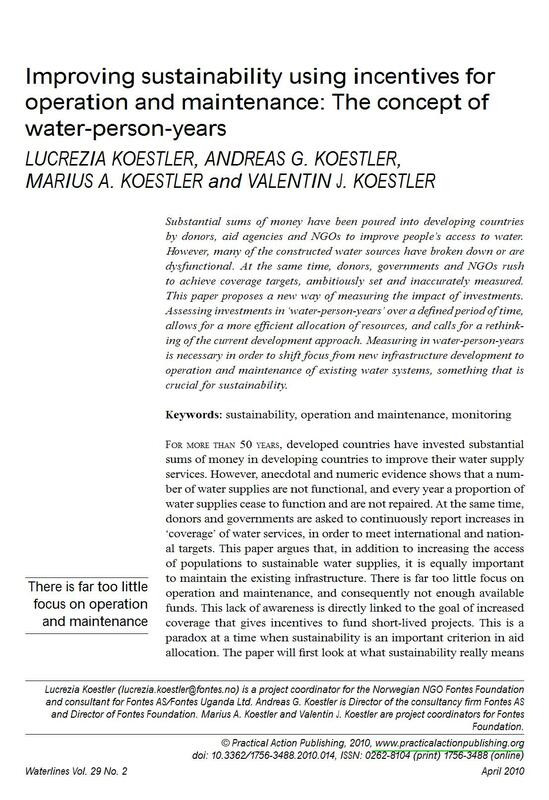 Assessing investments in ‘water-person-years’ over a defi ned period of time, allows for a more effi cient allocation of resources, and calls for a rethinking of the current development approach. Measuring in water-person-years is necessary in order to shift focus from new infrastructure development to operation and maintenance of existing water systems, something that is crucial for sustainability.